Performers include: William Fichtner, Eddie Cibrian, Kari Matchett, Lisa Sheridan Tyler Labine, Alexis Dziena, Evan Peters, Ariel Gade, Nathan Baesel, Aisha Hinds, and Ivar Brogger. This sci-fi drama series tells the story of a small Florida town in the aftermath of a hurricane and the appearance of some mysterious lights in the Everglade waters. 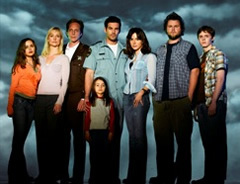 Characters include U.S. Park Ranger Russell Varon (Eddie Cibrian) and his children, Jesse (Evan Peters) and Rose (Ariel Gade); Sheriff Tom Underlay (William Fichtner), his wife Dr. Mariel Underlay (Kari Matchett) and teenage daughter Kira (Alexis Dziena); and Ranger Mona Gomez (Aisha Hinds). What can I say. It was a great show. So disappointed in the powers that be who decided not continue with the series. Series. I watch it every couple months. It’s just like abc to cancel of the best show on their channel & to leave the fans hanging like that. is so wrong. I’m still hoping they bring this back… love sci-fi, cheesy shows… i hate reality tv and that’s all i get every time i flip the channel… what da %%^#@@!!!! Have to agree with dave, especially, after cancelling Life on Mars, abc, I am about through with you and turning off the tv. I always wanted to know how Invasion ended…it was the best, cheesiest, tongue in cheek, sci-fi satisying show on the air…like finding late night old sci-fi movies in from the 50’s and 60’s. TV $$ rules and it is giving up its charm by giving up shows like these.